Our product is an interesting option, designed to constantly cover centre pivot wheel tracks, eliminating the formation of wheel track furrows. It can easily be fitted to any make of center-Pivot. Wheel track furrows have for many years been a problem with center Pivot irrigation in certain types of soil. When tracks are deeper than 100 mm there’s a risk of damaging the tower structure when wheels are forced to follow deep wheel furrows. Center pivot often get stuck in furrows where water tend to gather, softening the track even more. During spraying, cutting and harvesting operations deep tracks cause problems as well. With new installations, it becomes a preventative action as the two adjustable and perfectly angled disc wheels cut the soil, pushed out by the tyres, back onto the track preventing furrows from forming. It can be adjusted to form a slight ridge, keeping water from standing in the tracks. 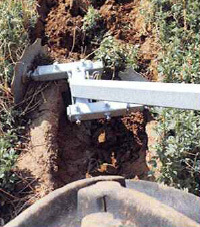 With installations where deeper tracks already exists, the discs can be adjusted deeper by putting more tension on the adjustable spring, filling the furrow with every rotation. It can fit all makes of center Pivots. It has an adaptor plate fitted between the gearbox and gearbox mounting plate. Although equiping all the drive units in a multi tower machine would make life easier, in less severe conditions units can easily be moved from one tower to the next by simply buying adaptor plates for all the towers and rotating the unit between towers by using the simple pin assembly, and thereafter re-adjusting the spring. It’s not necessary to equip all center pivots with it. In less severe conditions, one set that fully equip a center pivot can be rotated regularly between the other center Pivots. If the problem is happening only in one tower, one unit can be used on a permanent basis. To reverse the center pivot, the unit must be simply swung up against the tower leg. 2 responses to "The furrow buster"
Thanks for your information. Regards. 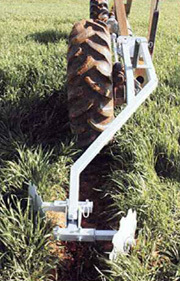 I would like to get one of these furrow busters.